The origin of cosmic rays, high-energy particles from outer space constantly impacting on Earth, is among the most challenging open questions in astrophysics. Now new research published in the journal Monthly Notices of the Royal Astronomical Society sheds new light on the origin of those energetic particles. Discovered more than 100 years ago and considered a potential health risk to airplane crews and astronauts, cosmic rays are believed to be produced by shock waves — for example, those resulting from supernova explosions. The most energetic cosmic rays streaking across the universe carry 10 to 100 million times the energy generated by particle colliders such as the Large Hadron Collider at CERN. 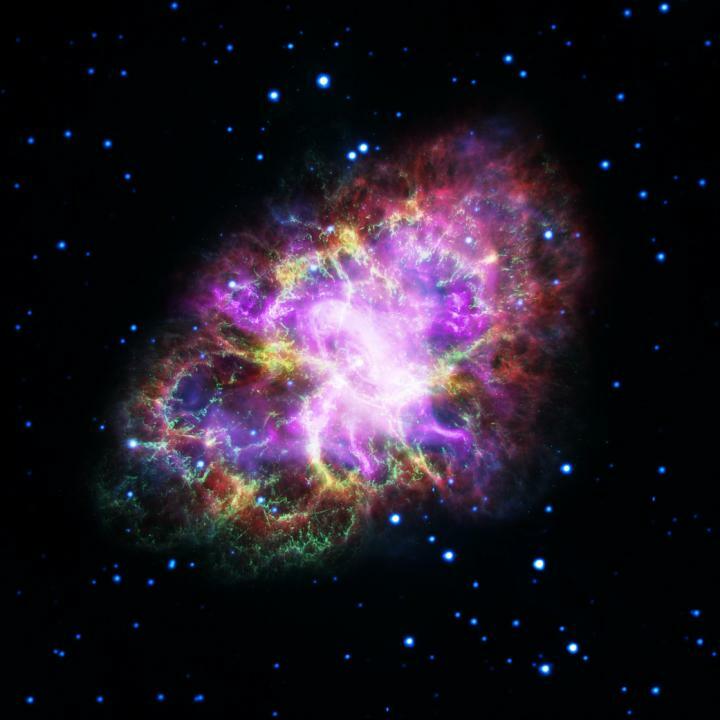 The Crab Nebula, the remnant of a supernova explosion that was observed almost 1,000 years ago in A.D. 1054, is one of the best-studied objects in the history of astronomy and a known source of cosmic rays. It emits radiation across the entire electromagnetic spectrum, from gamma rays, ultraviolet and visible light, to infrared and radio waves. Most of what we see comes from very energetic particles (electrons), and astrophysicists can construct detailed models to try to reproduce the radiation that these particles emit. The new study, by Federico Fraschetti at the University of Arizona, USA, and Martin Pohl at the University of Potsdam, Germany, reveals that the electromagnetic radiation streaming from the Crab Nebula may originate in a different way than scientists have traditionally thought: The entire zoo of radiation can potentially be unified and arise from a single population of electrons, a hypothesis previously deemed impossible. According to the generally accepted model, once the particles reach a shock boundary, they bounce back and forth many times due to the magnetic turbulence. During this process they gain energy — in a similar way to a tennis ball being bounced between two rackets that are steadily moving nearer to each other — and are pushed closer and closer to the speed of light. Such a model follows an idea introduced by the Italian physicist Enrico Fermi in 1949. "The current models do not include what happens when the particles reach their highest energy," said Federico, a staff scientist at the University of Arizona's Departments of Planetary Sciences, Astronomy and Physics. "Only if we include a different process of acceleration, in which the number of higher energy particles decreases faster than at lower energy, can we explain the entire electromagnetic spectrum we see. This tells us that while the shock wave is the source of the acceleration of the particles, the mechanisms must be different." Co-author Martin Pohl added: "The new result represents an important advance for our understanding of particle acceleration in cosmic objects, and helps to decipher the origin of the energetic particles that are found almost everywhere in the universe." The authors conclude that a better understanding is needed of how particles are accelerated in cosmic sources, and how the acceleration works when the energy of the particles becomes very large. Several NASA missions, including ACE, STEREO and WIND, are dedicated to studying the similar properties of shocks caused by plasma explosions on the surface of the sun as they travel to Earth, and so may add vital insights into these effects in the near future. The new work appears in: "Particle acceleration model for the broadband baseline spectrum of the Crab Nebula", F. Fraschetti and M. Pohl, Monthly Notices of the Royal Astronomical Society (2017) 471 (4) (DOI: 10.1093/mnras/stx1833).